Emergency fund? 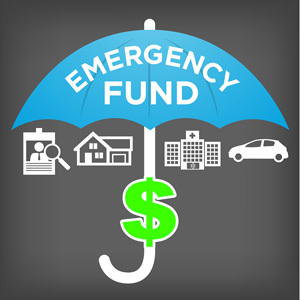 After bills are paid, groceries are bought, and the car is filled up, there’s not always a lot left over, but that’s exactly why you should work towards building an emergency fund. What happens if the dog gets sick, your hours get cut or the car breaks down? Without a financial safety net, you’ll be left in debt. Figure out exactly how much you can save each month. This may be the most painful part because you may have to consider cutting the cable or bagging lunch instead of eating out each day. Set aside what you can, even if it’s only a few dollars at first, every little bit helps. Once you’ve decided how much you can afford, set up an automated savings transfer so the money is moved into your savings account before you even see it. You’ll be less likely to set aside less when it happens automatically. To make it even easier on yourself, set up an account with a different bank than your checking account. Doing so will ensure you’re not constantly reminded of the money you could be using for daily expenses and reduce the temptation to skim a little off the top. Do a little research and find a savings account that pays at least 1% interest. Be sure to double check that you won’t get hit with monthly or annual maintenance fees, which counteract the interest you could earn. Your savings shouldn’t be your only disaster precautions. Be sure your auto insurance, homeowners insurance or renters insurance coverage is up to date. It’s important to reevaluate your policy after you buy a new car, move to a new home or make a large purchase. Start saving today so you’ll be prepared before an emergency strikes and begin your path to financial stability.